September | 2009 | Let Teddy Win! The Let Teddy Win fans were out in force on Tuesday night to watch the Nationals win their penultimate home game of 2009. An ABC News crew was on hand in Section 131 to document Teddy Roosevelt’s travails in the presidents race, and the Bull Moose did not disappoint (or did, as the case may be…). Teddy maintained a slight lead through the first half of the race, but faded down the stretch, finishing a distant last as George Washington and Thomas Jefferson each helped pull Abraham Lincoln into the lead to take his 40th victory of the season. To celebrate, Abe led George and Tom in a presidential bunny hop along the first base line. Wednesday’s season finale is being billed as Fan Appreciation Day, with free fleece blankets and countless other giveaways throughout the afternoon. Rumors are flying about the presidents race finale’. George and Tom remain tied for second place entering the game, but the real story is whether Teddy will pull out a season-closing victory. Crowd photo courtesy of Cheryl Nichols of Nats News Network. Race photo courtesy of Brian Mosley. 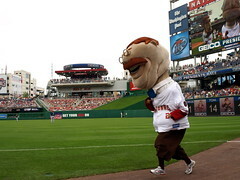 After a 4-game absence from the Washington Nationals presidents race, Teddy Roosevelt today confirmed that he’ll be back in the race for today’s 1:05pm start vs. the Atlanta Braves at Nationals Park. Meanwhile Abe Lincoln ran away with last night’s race, jumping into the stands afterward to exchange high-fives with fans along the first base line. Teddy Roosevelt “getting treatment,” will skip presidents race again. The Washington Nationals confirmed today that racing president Teddy Roosevelt would be held out of tonight’s presidents race at Nationals Park, marking the third straight race without fan favorite Teddy. The mysterious injury was first revealed on September 6, when it was announced to fans at the Park that Teddy had been injured during pre-game warmups. Roosevelt returned the next night and competed in the next 4 races, looking good and even finishing first on September 8, only to be disqualified from that race for cheating. However, Teddy has not appeared since that homestand ended on September 10. Unconfirmed rumors suggest that the hamstring story is a Nationals cover up for a wardrobe malfunction. 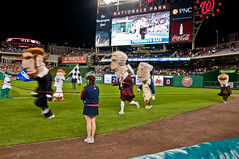 Teddy Roosevelt sat out the presidents race at Nationals Park for the second night in a row Wednesday night.